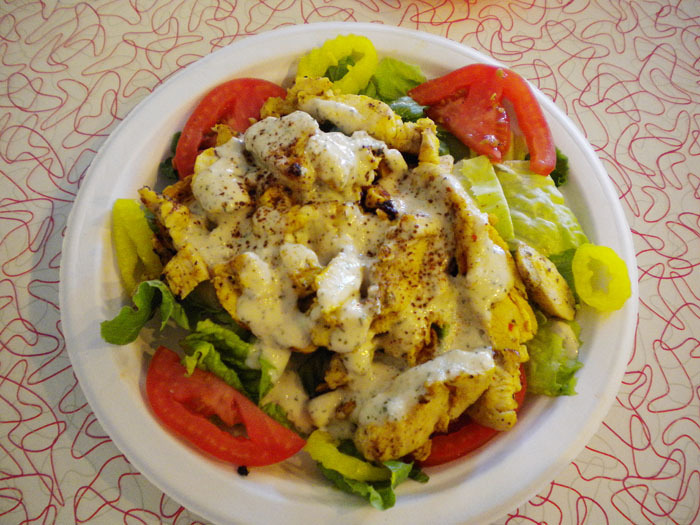 Let me first say that I am not down with all the distinctions between all the middle eastern and mediterranean countries as far as their food, and I don’t think that the restauranteurs of Colorado Springs are either. So I’m going to ignore any incorrect restaurant names, inauthentic recipes, or that kind of thing. When I move to New York City, maybe I’ll be more concerned with that stuff but for now, I’m going to tell you about two middle eastern places we’ve recently been to. 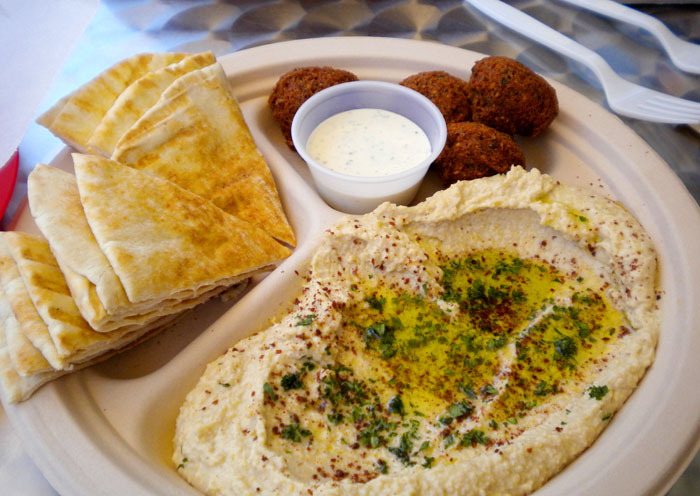 First was Taste Of Jerusalem on Bijou in downtown Colorado Springs. I did not have anything to eat here because I had forgotten that I actually LIKE middle eastern food. But when Mike got his stuff, I remembered. So we went again like 3 days later. 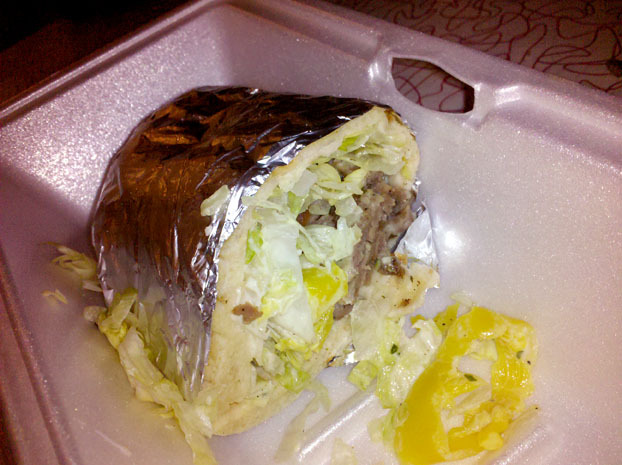 The first time Mike had the Taste Of Jerusalem sandwich which was lamb, chicken, and beef in pita with lettuce and sauce. The second time he had the same thing and added some falafel on the side. I don’t really like falafel. I know. A fried thing I don’t like. Go figure. I had the chicken sandwich and some french fries. The sandwich was good, it was chicken, lettuce, peppers, and sauce. 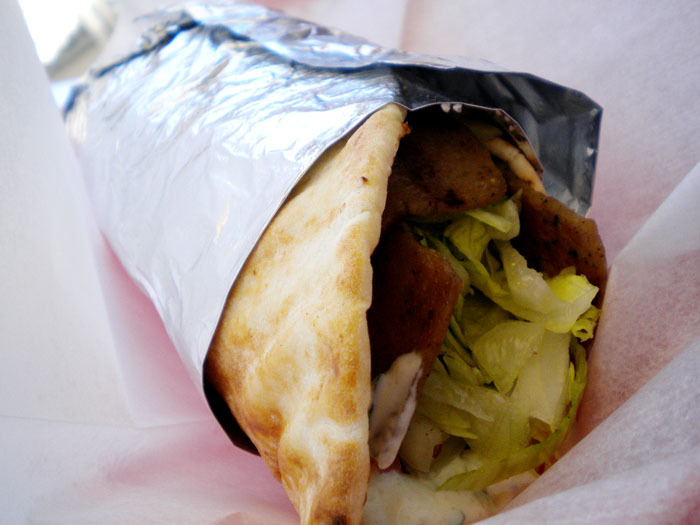 It wasn’t the thick tzatziki that you get at a lot of places but it was good. 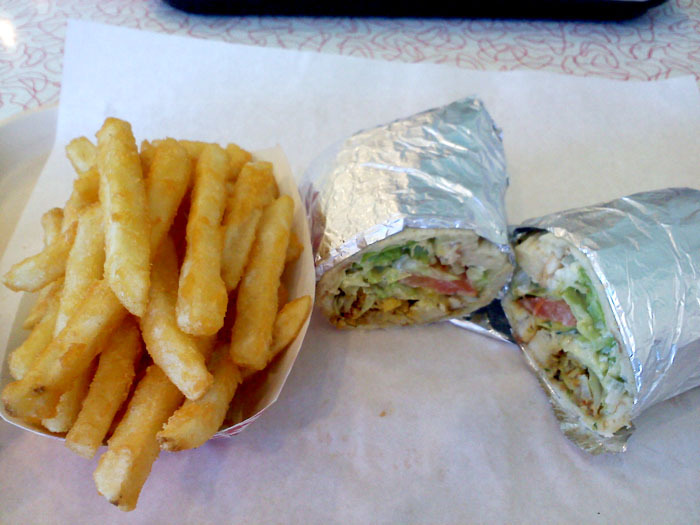 The fries, OMG, they were magical. I don’t know what they do to them but they are awesome. The first time we went it wasn’t crowded and we got our food right away. The second time it was more crowded and it took an age and a half to get our stuff. I think there’s just the one guy running it, so Iguess it’s to be expected. Anyhow, service issues aside, I think we’ll most likely go here again. After we go to the 20 other middle eastern places around here. The other one we went to was Arabica Cafe. It’s been here a couple of years but I always thought it was a coffee place. You know, like arabica coffee. I know it says “Taste Of The Mid-East” on the sign but I thought it was middle eastern coffee which really didn’t sound all that delicious to me. I also thought it was a chain, which it’s not. So, anyhow, I never went to what I thought was a middle eastern chain coffee house. But of course, it isn’t. It’s a middle eastern FOOD place. I had the hummus bowl. 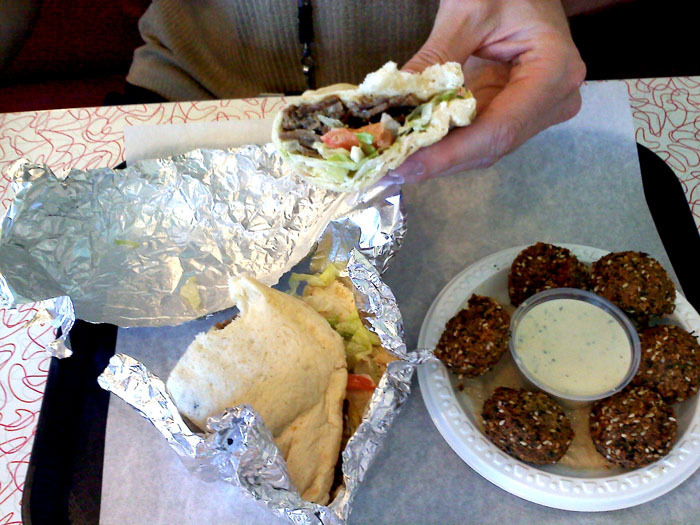 No, those falafel aren’t mine, Mike ordered them but they somehow wound up on my plate. The hummus was good. A little too salty, maybe, but overall really tasty. 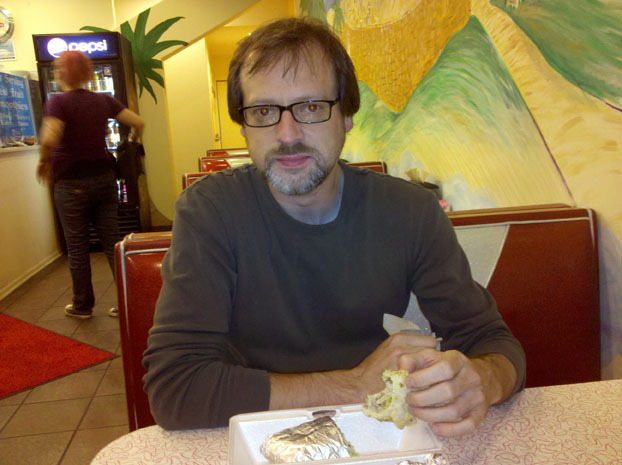 Mike had a beef shawarma sandwich which he enjoyed. I had a bite of it and I liked it, too. It did have that thicker sauce on it, which was good. I liked this place, too, because you can sit outside. That always gets extra points with me, especially in the summer. 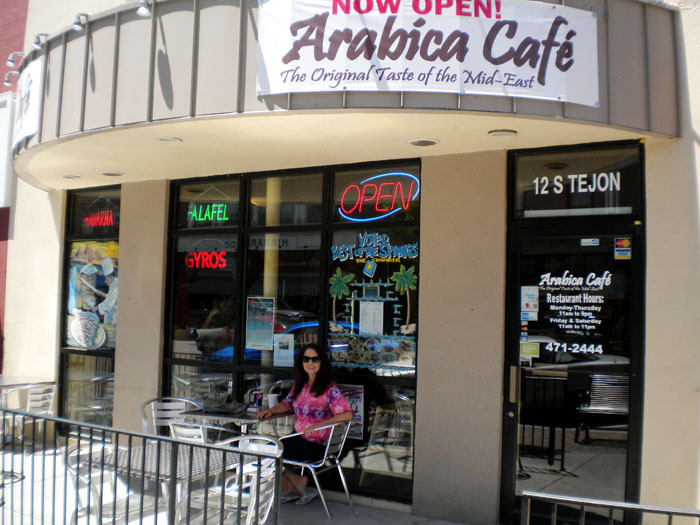 Anyhow, both Arabica Cafe and Taste of Jerusalem are good. You should go.